My friend Katherine and I are both involved in great romance. As lovers of tea, we've been mining the vein of gold that comes from pouring boiling water over camellia sinensis leaves for years. More recently we've both been writing poetry about tea. My tea poems are a series of little sips of words that I've glued onto black card stock and have been shuffling around like playing cards, as the ebb and flow of their order slowly reveals itself to me. Katherine, one of the managers of Floyd's Harvest Moon Food Store has been ordering their tea for years. At home, in her newly renovated terra cotta kitchen, she's been sampling exotic varieties, delving into their mysteries, and writing about them. It was time for a gathering of the TEAPOET SOCIETY. When she invited me for a small tea party on Sunday, I said, "Sure. I need to do some more "research" for the tea poems I'm writing. I also need some new photographs, and you have the best teacups in town." Dark brewed oracle ... Three cups full ... A holy trinity ... from St. Brigit's well ... We both love tea, especially of the black persuasion, but she is the real connoisseur. There were three of us present. Gathered around her dining room table, she brought out a large block of tea, so compacted that she had to use a chisel to break off a piece for the pot. 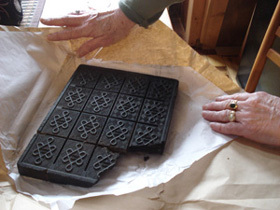 It looked like dark chocolate, or a hardened block of rich earth, with an elaborate design pressed into both sides. I had never seen anything like it. Lowering my face down close to inhale, I jumped back and gasped. 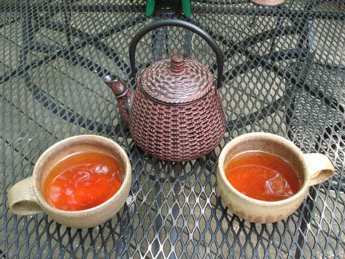 The aroma was undeniably tea, earthy but with just enough sweetness to be irresistibly alluring. "It's like a gold brick with its value disguised until it's released in hot water," I said. Indeed, tea was once used as currency, Katherine explained. It's also been linked with poetry and meditation for ages and has been the basis of something nearing religion, Teaism, as revealed in the 1906 book by Okakura Kakuzo, The Book of Tea. Katherine does her research too. 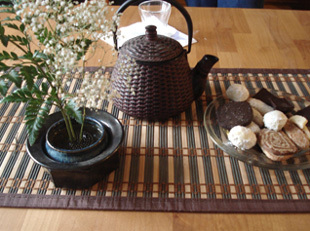 The block was pu-erh, a tea from China that is fermented and aged, and classified by year and region of production much like vintage wine, she told us. We drank out of crystal cups so that we could enjoy the amber liquid as it emptied, like watching a sun set disappear into the horizon. And the combination of sipping and reading poetry did prove to be intoxicating. Of the eighth century, Lu Yu. From the Center of the Yangtze River. And from the improper depth! "And they think we're fussy when we ask for boiling water to be poured over our tea?" I said. Before I left I asked her for a copy of the poem so I could put it in the next Museletter (our community newsletter). "I want everyone to know this," I said. Post Note: Read more about the Teapoet Society HERE. Amazing how many people don't realize that boiling water is necessary for brewing tea properly. I am very interested in the medicinal properties of various teas... a licorice/marshmallow/slippery elm bark tea I know about does more for my sore throats than any over-the-counter remedy. While I've been roasting coffee, my husband's been experimenting with teas to find the right combination for a good iced tea. There's almost always a pitcher of pretty-colored, good-smelling iced tea in our fridge these days. I guess I have seen tiny blocks in catalogs...but nothing like that. I have started to drink more tea since Christmas. I bought some "Tea of Life" to give as presents and saved some for myself. It was so good that I went back to buy more! It is packaged in small pyramids; maybe you have seen it. i would love to find a small block of tea. have never seen anything like this. must ask hubby if he has (he is from india). the photo of it resembles a huge block of big oreo cookies! I too thought that was a picture of a block of dark chocolate. I never knew tea to be in that form. I'm really enjoying your little "sips" of tea...what a perfect way of describing them! I have this picture of you and Janean at Spoken Word alternately reading tea and coffee poems - sort of a poetic dueling banjos...of course, the concept might not work since her poems tend to be long. Lovely where to buy blocks?? Drs, recommend oolong, floressence and gfreen tea for my cancer since they do not build up and are beneficial for the body. I am a tea fiend. oh, I just ordered a crummy cup of hot tea when we were out to dinner last night. Sigh. I love my tea. I have antique teacups from my grandmother, and a couple of teapots I love to use. I just wanted you to know that I felt uneasy this morning, and like usual, I came to see you and you made me feel so much better! All that tea must be turning you into a healing cup yourself! Hi Colleen, thanks for stopping by my blog this morning, I don't have the flu, Chrissie is the last out of the 7 of us in my house currently to get the flu! I don't intend to get it though- I'm crediting the soy protein mix I drink in the mornings for breakfast as improving my immunity. I'm glad HP did right by you, most companies nowadays seem to be beginning to realize, if they don't do well by their customers they're going to pay. I actually just have to have coffee in the morning but tea is fine any other time. I have a tea cup collection that is very unique. I should post pics sometime. The handles are all solid flowers or butterflies instead of having a hole for your fingers. Wow. And all I've ever had is the deep south iced sweet variety! I've been a Teaist all my life, since my mother would add lots of milk to my cup of hot "Lippon" tea, as I called it. Teaism and Taoism seem extraordinarily compatible to me. Writers drink latte and poets sip tea"
I don't like the taste of coffee or salsa or latte. And I have always loved tea. Does that mean I'm a poet ... or at least a poetic writer? Oops! I read too fast, without first engaging brain. Salsa MUSIC ... duh. You are always involved in the coolest things...things most would never even dream to be so cool. I'm also a tea nut - probably in my Irish roots! lol It's difficult to find other tea lovers in France, which is big on coffee, but I've noticed it becoming more popular in the last few years among friends and workmates. Or is that just my influence? :-) Lovely post, which made me rush off to put the kettle on ... to make a nice pot of almond and apricot tea. I love the teapot in the top photo, and that tea looks really interesting. I've been buying Silver Needle white tea from teavana, and I love that. There is so much to learn about teas. And I so agree with you, every time I go to a Starbucks or Barnes and Noble and order tea, it tastes terrible. How lucky to have a tea expert as a friend! I initially thought that was a block of chocolate too! I never knew that tea came that way. One reason restaurants often have bad iced tea is because they add cold water or ice to it to cool it off. The shock causes the tea to cloud up, and screws up the taste.